All the Xiaomi phones run on the MIUI ROM and MIUI 6 is the latest version that the company released few days back. The MIUI 6 ROM is available for the Redmi 1S, Mi3, Mi4, Redmi 2 and Redmi Note. 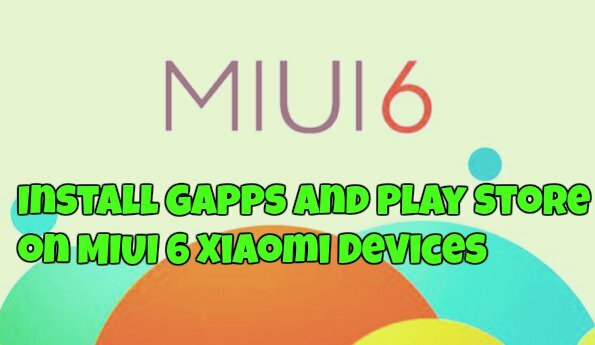 Most of the Xiaomi users already installed the MIUI 6 ROM manually on their device, now most of them are now facing some problems, major one is non-availability of Gapps (Google Play store and Other Google apps) and crashing of Play Store after updating to MIUI 6. If you are the victim of the same problem, then this guide is for you. Here we’ll show you how to flash the GApps package on your Xiaomi device. Once the Gapps Packages is flashes, you can easily enjoy all the above mention application on your android. Read all the step very carefully and follow them step by step on your phone. Step 1. To do this you need a phone with custom recovery like TWRP or CWM. Don’t use the stock recovery to flash the Gapps. Step 2. Download Gapps zip file for MIUI 6 here and don’t extract the folder. Step 3. Now move the Gapps Zip file on your phone internal memory. Step 4. Boot your phone in recovery mode to flash the zip file. Step 5. Once you are in the TWRP or CWM main screen, Wipe Cache & Dalvik. Step 6. Now select the Gapps zip file and flash it on your phone. The flashing process will take some time. Step 7. Once completed, Reboot system. Voila! Now all the google application are successfully installed on your phone. It’s possible to install in the way You make holes in Your software. It’s a BAD way! You show people how to brake their phones, but not improve or help. Just stop wasting our time.